When I saw this beautiful recipe for an orange cake freckled with blueberries I decided to add lemon to the mix, making it a citrus cake instead. 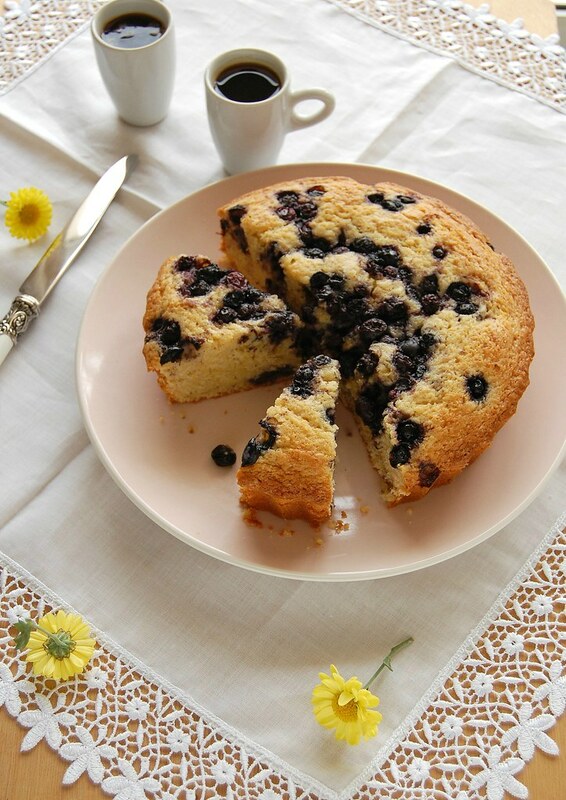 The cake turned out delicious – both oranges and lemons are wonderful paired with blueberries – very tender and also pretty from being baked in a tart pan. Preheat the oven to 180°C/350°F. Butter a deep 22cm round loose-based flan pan or cake pan*, line the bottom with a circle of baking paper and butter the paper as well. Dust it all with flour and remove the excess. Combine the flours, baking powder, salt and sugar in a large bowl. Add the eggs, milk, vanilla, zest, juice and butter and mix until combined. Spoon into the prepared pan. Top with half of the blueberries and bake for 20 minutes. Sprinkle over the remaining blueberries and bake for another 20 minutes (my cake needed 35 minutes in the oven after the second batch of blueberries were added). Cool in the pan for 25 minutes, then carefully remove the outer ring of the pan. Cool completely before slicing and serving. If only you'd posted this a couple of weeks ago, I had more blueberries than I knew what to do with! I have never baked with buckwheat flour but this looks wonderful. Bookmarking to try soon.